After several years of producing Rhones and occasional chardonnays, Babcock Winery and Vineyard has come full circle and shifted its focus back to its roots as a pinot noir powerhouse. Working under the direction of owner and founding winemaker Bryan Babcock, winemaker Colin Kress calls the winery’s renewed emphasis on Sta. Rita Hills’ vineyard-designate pinot noir and chardonnay a “really exciting” step. “Today, versus three or four years ago, when Babcock make two estate pinot noirs, several syrahs and some ‘random’ whites,” he explained, the winery now showcases the grape varietals for which the Sta. Rita Hills AVA is best known — pinot noir and chardonnay — and made its focus several vineyard designated wines. Like others devoted to their craft, Kress radiates passion for winemaking. But unlike others, he brings extra knowledge to the cellar: He’s set his sights on the distinguished Master Sommeilier honor and already has spent years studying wines and viticulture from around the world. Kress, who turns 33 today (July 13), spent his youth in Tucson, Ariz., where his family owned restaurants and his uncle worked as a certified sommelier, Kress said he sampled and developed a taste for European wines while still a student in high school. His goal is membership in the Court of Master Sommeliers, where Kress said he would be “one of less than one dozen who are practicing winemakers.” Later this year, he will sit for his Level 3 certification exam, which would pave his way toward the invitation-only Master Sommelier Diploma Exam, which includes three sections — theory, blind tasting and a practical service component. Babcock Vineyard & Winery photo/Most of the original estate grape vines have recently been replaced by various clones of pinot noir, the winemakers’ renewed focus. In early spring, Kress led me through a barrel tasting of several of Babcock’s 2011 vintages still in barrel — two chardonnays and nine of the pinot noirs. The Babcock chardonnays were Top Cream (estate) and the Mentor chardonnay, which is sourced from grapes grown in the esteemed Rita’s Crown Vineyard, located on a southwest-facing slope in the Sta. Rita Hills. Bryan Babcock named the winery’s Mentor chardonnay after Ken Brown, his winemaking mentor, Kress said. Kress said he expected that the approximately 160 cases of the Babcock 2011 Mentor Chardonnay would be released by early summer. Two of the 2010 pinot noirs, the estate “Ocean’s Ghost,” and “Precocious,” each priced at $60 per bottle, represent efforts by Babcock and Kress to produce superb quality at above-average prices. (The 2010 Ocean’s Ghost pinot noir is sold out). 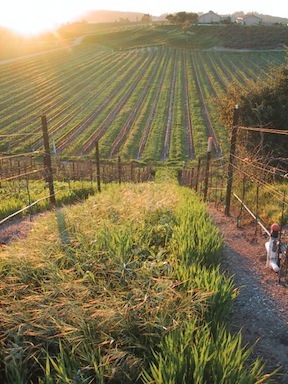 As part of the Babcock family’s efforts to refocus its production on pinot noir, all of the 90-acre estate vineyard’s original plantings — with the exception of the Top Cream chardonnay and existing pinot noir vines — have in recent years been replaced with additional blocks of more of the grape varietals for which the cool, fog-laden Santa Rita Hills are famous, Kress said. Seventy of the 90 acres are now planted to pinot noir vines, with “very little chardonnay and sauvignon blanc,” the latter being one of the original grape varietals planted on the estate. Annual production ranges between 17,000 and 22,000 cases, Kress said. When the Babcock family, headed by Bryan’s parents Walt and Mona, bought the property in the late 1970s, most of the land was planted to fig and apple trees, Kress noted. In 1980, the Babcock family planted its first vineyard: 25 acres of several varietals, among them riesling and gewurztraminer, Kress said, and in 1983 and 1984, the first vintages were released under the Babcock label. If Bryan Babcock considers Ken Brown his mentor, Lompoc resident Kress has ardent praise for Babcock. After a “short harvest with (Ken) Brown, and a stint “helping out” at Ampelos Cellars, Kress emphasized that he “settled down and learned how to make wine here (at Babcock). After five years at the winery, “my winemaking skills are very much Bryan Babcock,” Kress noted. As winemaker, Kress’ duty is to “keep Bryan updated” on the day-to-day work involved in making wine while the latter works in the lab alongside winery microbiologist Patty Collet and helps the entire vineyard and winery crew strategize.